Bravo Buffalo provides a service better known as concrete raising, concrete leveling or even concrete lifting. Concrete raising is a process for raising and supporting settled sunken uneven concrete. We utilize the latest in polyurethane foam injection technology. 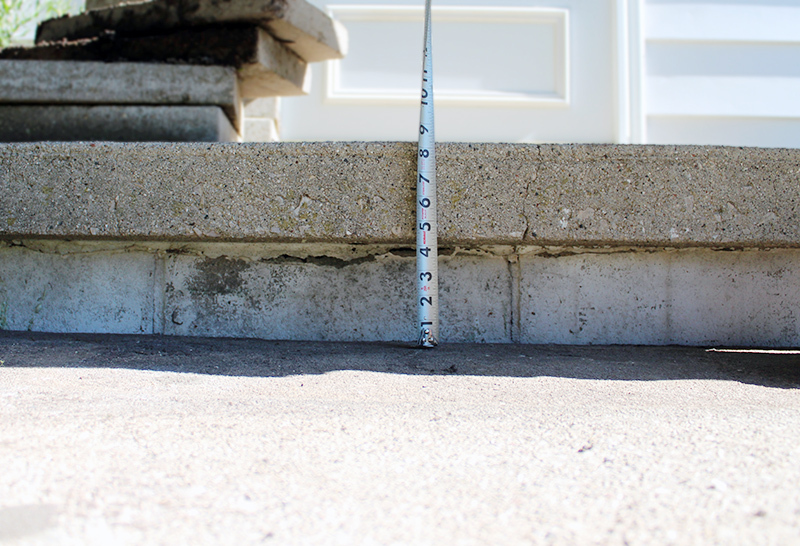 Polyurethane is the environmentally friendly solution to your concrete raising needs that puts significantly less pressure on your home’s foundation. Until recently, mudjacking was the common method for lifting concrete. Both polyurethane and mudjacking achieve similar results. That being said, how these results are achieved and the overall performance of these products is different. Don’t be fooled by competitors claims! Here are some reasons why you should choose Polyurethane over Mudjacking/Limestone Grout. Polyurethane is an environmentally safe, nontoxic liquid polymer foam. The foam itself only weighs about 2 points per cubic foot. Polyurethane is impervious to water and decay, making it a perfect choice for an environmentally friendly solution that will last a lifetime. The foam is injected into the soil through penny-sized holes in the concrete. The foam then undergoes a chemical reaction and expands to stabilize the soil and lift the concrete. The polyurethane cures after 15 minutes. Following repair, the injection holes are filled with cementitious grout to match the surrounding concrete. Long Lasting. Polyurethane cures as a solid, impermeable structure that is not susceptible to fracture. Polyurethane will last longer and need fewer repairs than mudjacking. Mudjacking itself is a short-term, cheap fix. Lightweight. Weighing only 2 pounds per cubic square foot, this material is light. Being lighter, there are fewer chances the slab will sink back down due to weight. In the end, 6 – 8 pounds of foam accomplishes what 100 – 125 pounds of mudjacking grout fill will. Fast. Polyurethane cures within minutes. Traffic can resume immediately once we leave the job. This repair typically takes a 1-2 hours based on the scope of your project. Fewer, Small Holes. Concrete will be lifted quickly and effectively without damage to the top layers. Stabilization. Injected as a liquid, this material reacts within the loosely, uncompacted soil to solidify and stabilize the soil. Polyurethane creates a barrier to moisture, chemicals, insects, rodents, and erosion. Cost Effective. Polyurethane concrete raising is an efficient and a cost-effective alternative to replacing concrete. The savings may be even greater because raising concrete eliminates the costs of demolition, removal, and landscaping. Bravo does NOT use toxic chemicals. We often associate toxic chemicals such as blowing agents, formaldehyde, benzene, and toluene with polyurethane. These toxins are NOT used in Bravo foams. The warnings you find online pertain to these chemicals. As safe as the cushions you sit on! The foam we install in the ground is like the foam you sleep on in your mattress and sit on in your couch. We make the foam directly under the slab, instead of purchasing it from a factory. When cured, instead of being light and fluffy, it is firm and strong to hold up even at railroad crossings! Bravo purchases its material from the world leader in manufacturing equipment, system development and material formulation for lifting and leveling concrete. We pride ourselves on providing only the best materials for your needs.